The photograph below is taken from the Cheltenham Chronicle & Gloucestershire Graphic of 4th April 1925. 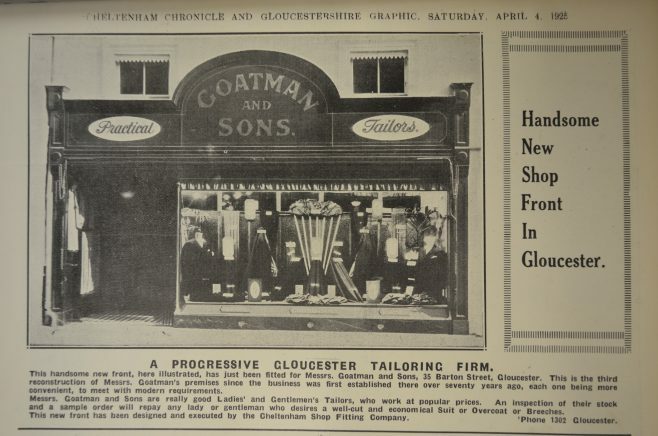 It shows the redesigned shop front of the appropriately named Coatman & Sons, long established tailors of Barton Street. Does anyone have any memories of Coatman & Sons, which they would be willing to share? If so, please leave a comment at the bottom of this page or on our message board. Back copies of the Graphic are held at Gloucestershire Archives. We are grateful to Dave Bailes for identifying this item. You can see a larger version of the image by clicking on it.